Found only in New South Wales and southern Queensland. UPPER: Typical colour form from Watsons Bay, Sydney Harbour, NSW, 10m, 32mm long, September 1981. LOWER: Northern colour form from Solitary Islands, northern New South Wales, 49mm long, March 1988. This large white chromdorid with a thin yellow border and bright red spots is an easily recognisable chromodorid in New South Wales waters. 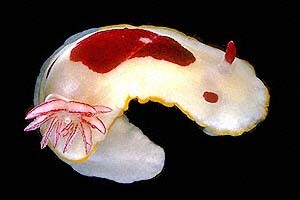 It has red rhinophore clubs and white gills, quadrangular in cross section, are lines with red. In northern New South Wales the normal colour form, with many red spots is often replaced by specimens with a few large spots, and often a single large central spot. 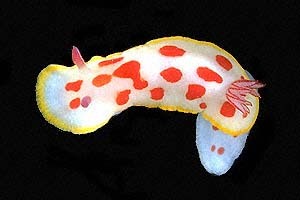 Compare this colour form with the spotted colour form of Chromodoris fidelis which has a sympatric distribution. There are many red-spotted species of chromodorid in New South Wales and southeastern Australia. I have discussed this example of mimicry on a separate page. •Rudman, W.B. (1983a) The Chromodorididae (Opisthobranchia: Mollusca) of the Indo-West Pacific: Chromodoris splendida, C. aspersa and Hypselodoris placida colour groups. Zoological Journal of the Linnean Society 78: 105-173.